Mingle, snack, and sip without losing track of your drink or apps thanks to this clever design. You just found your new favorite party companion. 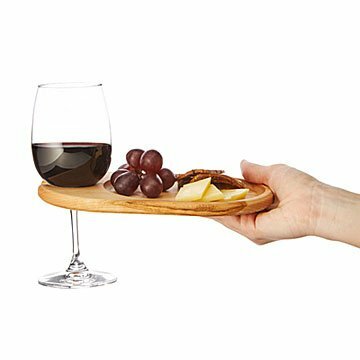 Never worry about finding a place to set your wine glass down again— now you can mingle, snack, and sip away, holding your drink and small bites together on this handcrafted maple platter. Each tray is carved and finished with a bevel around the edges, so it's easy for you to hold and secure for your wine glass to sit in. Next, it's sanded, soaked in water, dipped in mineral oil and hand rubbed to food-safe, water-resistant glory. It's an instant hit with party hosts and guests alike. Handmade by Michael and Ania Shepler in Mechanicsburg, Pennsylvania. Set of 4. Wash with mild soap and water. Help condition and preserve your Wine & Appetizer plates with mineral oil. Let's face it-- no one needs to have a wine glass/app plate holder in one. But the cool factor of these trays was too good to pass up for the price/value. When I entertain everyone always hovers around the kitchen so these glass/app plates are perfect since there is not a lot of room for people to place their glasses. Plus, as someone with hand arthritis, it can be uncomfortable/difficult for me to grasp a glass in one hand and hold something else in the other hand. Love these!